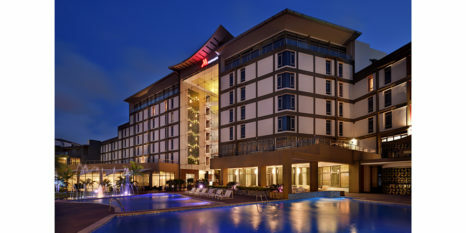 Accra, Ghana, 2018-May-02 — /Travel PR News/ — Marriott Hotels, part of Marriott International, today announced its debut in West Africa, with the highly anticipated opening of Accra Marriott Hotel. Owned by African Hospitality Limited, the hotel is strategically located opposite the Kotoka International Airport, making it the perfect “Gateway to West Africa”. Set in the heart of Airport City, a burgeoning urban development, the Accra Marriott Hotel is just a few kilometers outside of the central business district providing easy access to major corporate businesses, government entities and well known city landmarks. To find out more about the hotel visit www.accramarriott.com and stay connected on Facebook. With over 500 hotels and resorts in 59 countries and territories around the world, Marriott Hotels is evolving travel through every aspect of the guest’s stay, enabling the next generation to Travel Brilliantly. Boldly transforming itself for mobile and global travelers who blend work and play, Marriott leads the industry with innovations, including the Greatroom lobby and Mobile Guest Services that elevates style & design and technology. Marriott Hotels is proud to participate in the industry’s award-winning loyalty program, Marriott Rewards® which includes The Ritz-Carlton Rewards®. Members can now link accounts with Starwood Preferred Guest® at members.marriott.com for instant elite status matching and unlimited points transfer. To learn more, visit www.MarriottHotels.com. Stay connected to Marriott Hotels on Facebook, @marriott on Twitter and @marriotthotels on Instagram. This entry was posted in Hospitality, Hotels, Travel, Travel Management, Travel Services, Travelers and tagged Accra Marriott Hotel, African Hospitality Limited, Alex Kyriakidis, Ghana, Marriott Hotels. Bookmark the permalink.